Disclaimer: I do not, actually, have a crush on my boyfriend’s friend, who we’ll call Ralph Macchio. The real Ralph Macchio is on my mind because I want him to win the crap out of Dancing With the Stars next season – though I’ve never seen an episode. But really. The Karate Kid?! My Cousin Vinny? Heck, he was even adorable on Ugly Betty! Let’s go Macchio! Anyway, the pseudo Ralph Macchio has excellent taste in colorful shirts. And despite my incredible desire to be lazy on Sunday we enjoyed 90 minutes of YogaX together, where I melted into several Warrior series and cursed the phrase “Yoga Belly” before we went out in the rain for sake and sushi. Ralph can cook, and (possibly to appease my desire to have a partner in the kitchen) my boyfriend put us together a few weeks ago when he was visiting to make brunch for some friends. And in single moment of delicious, crisp, buttery potato perfection, Ralph reminded me of the state of bliss potatoes reach when you’ve taken the time to par-boil them properly before roasting. So I made them tonight to go along with Phat Tuesday dinner after a long day. And my little sis wanted the recipe. And so I reminded her that I have a blog for that purpose. Then she remarked that my holiday header is gone… showing that she hasn’t actually been on this site since Christmas. Family is awesome! Truly. 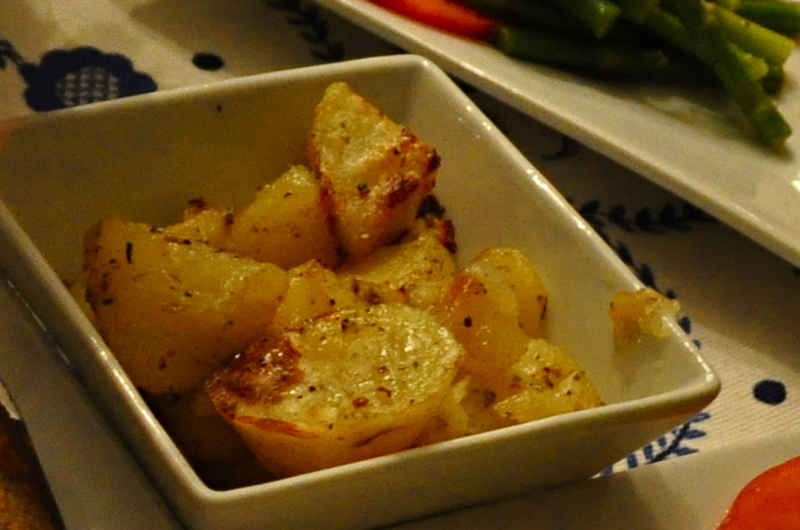 It was a delightful night of food and conversation, and sinfully crispy potatoes. your combination of any of the following: garlic powder, onion powder, crushed red pepper flakes, dried basil, dried oregano, white pepper, dried lemon etc. 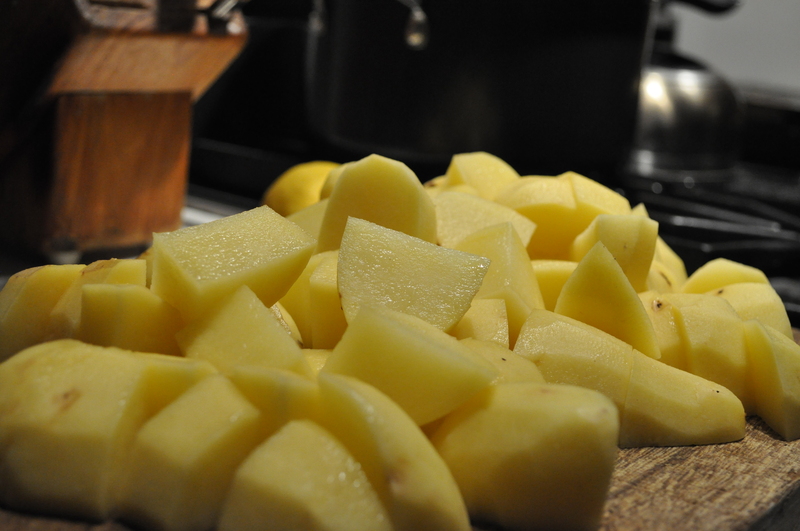 Peel and cut your potatoes into wedges about 1 – 1 1/2 inches big. While doing so, place a large pot of water on to boil with a good amount of salt (I used about a tablespoon) and preheat oven to 400 degrees F.
When the water is at a good boil, drop potatoes in and cook about 5 minutes, until a fork just pierces into them but they’re still very firm. Immediately strain and allow all water to fall off. Coat a medium baking dish (I used a classic Pyrex glass dish) with about 3 Tbsp Olive Oil (one that rocks your world) and toss potatoes in to coat. Add freshly cracked salt, pepper and seasonings to taste. If you’re not sure what to try, I recommend grabbing a premixed spice blend – they’re easily available now and usually mixed pretty classic-ly. Roast in preheated oven for approximately 25 minutes, tossing occasionally. Turn heat up to a broil and broil for 5-8 minutes until golden. Eat the crap out of them.